This section deals with a large amount of miscellaneous references, allusions, and crossovers to the outside world; both references made *in* FF games, and references other sources make *to* Final Fantasy. For corrections/additions, go here. Dynami Tracer (SNES - unknown release date): This extremely obscure Squaresoft game for the Satelliview (an SNES add-on only released in Japan) was some kind of cross between RPG and racing. In any case, good old Tonberry is one of the racers! One boss, the Machine, looks the same as FF1's Warmech. In the Japanese versions they both have the same name: Death Machine. Amongst the top tier monsters which can only be obtained as party members are FF1's four fiends. The strongest zombie is Lich, strongest octopus is Kraken, strongest dragon is Tiamat, and strongest snakewoman is Lilith (both Lilith and Kary share the Japanese name Marilith). He also notes that FFL uses a number of FF1's sprites. It is likely that the town sprites are the same, and FF1's thieves look the same as FFL's male mutants. Final Fantasy Adventure (Seiken Densetsu) (GB - released 6/8/91 JP, 1991 NA): This Game Boy title has very little in common with other Final Fantasy games, which is why it is not in our canon game list. One of the commonalities it does have are the Chocobos and Moogles which feature heavily in the storyline. This is actually the first time Moogles were named in a Squaresoft game! Also, the graphics are very reminiscent of FF3 and FF4 (even the menu screens!). Secret of Mana (Seiken Densetsu 2) (SNES - released 8/6/93 JP, 1993 NA, 11/24/94 EU): Moogles make another appearance here (as a status ailment, and as a species in the northern part of a forest). Besides this, the secret Moai face mentioned in In-Series Crossovers makes an appearance here as well! Secret of Evermore (SNES - released 1995 NA, 2/22/96 EU): The American copy of Secret of Evermore had some very blatant character crossovers. Firstly, Cecil from FF4 now runs a weapons/armor shop and inn in Ebon Keep. The music track for this area is called "Cecil's Town". Seiken Densetsu 3 (SNES - released 9/30/95 JP): Also known as Secret Of Mana 2. 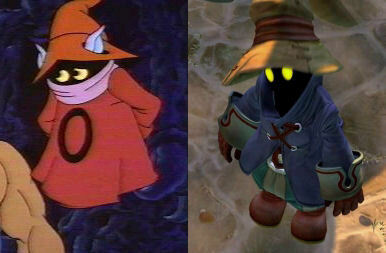 The "Magician" enemy from this game is identical to the "Black Mage" Job, right down to the crescent on his hat! There's also a piece of armor called the "Moogle Smock". Bahamut Lagoon (SNES - released 2/8/96 JP): An only-in-Japan game. 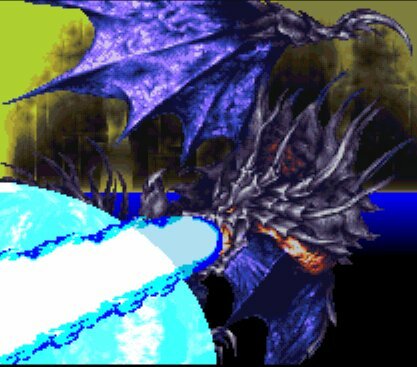 Obviously besides Bahamut himself, as a summon, there's also the Presenter, a sorta-secret monster who also happens to appear in FF6 as an optional mini-boss. One of the final forms of Thunderhawk, "D.Chimera", looks very similar a monster of the same name from FF5. 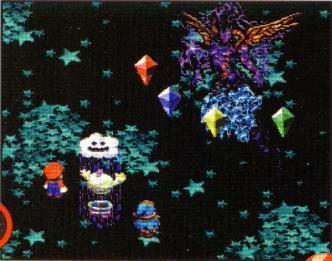 Super Mario RPG (SNES - released 03/08/96 JP, 03/09/96 NA): A hidden boss in Monstro Town - Culex. 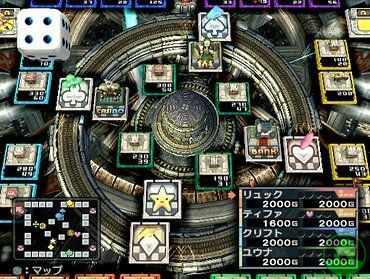 Although this boss doesn't appear in any Final Fantasy, his cohorts, the four Crystals, should be familiar to everyone! His boss music is identical to that of FF4, and the victory music is the ever-loved Victory Fanfare. 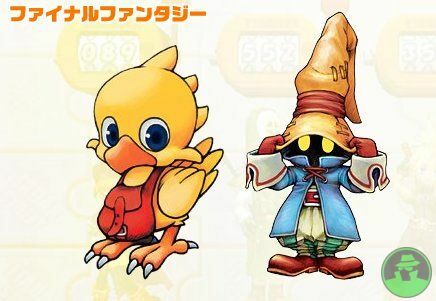 Tobal 2 (PSX - released 3/31/97 JP, 4/25/97 NA) : Chocobo is one of the hidden characters . Xenogears (PSX - released 2/11/98 JP, 1998 NA) : Hanging on the wall in a house in the upper-class Solaris community is a poster of Tifa! 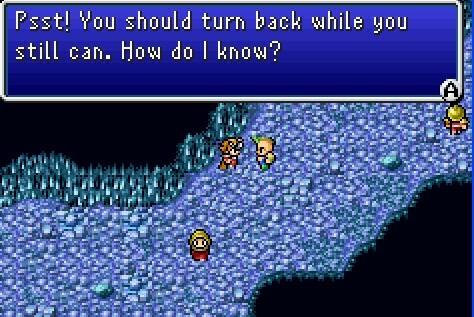 Also note that two characters here are named Roni and Rene, which are the same as the middle names of Edgar and Sabin from FF6. See Name Origins for more info on that. 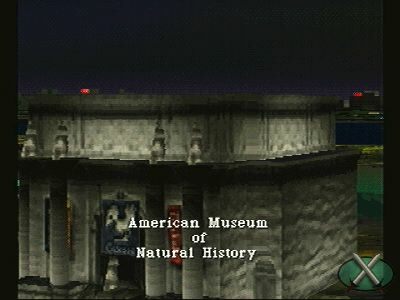 Parasite Eve (PSX - released 3/29/98 JP, 1998 NA) : The hanging banner in front of the Museum Of Natural History has a Chocobo on it. Also, inside the museum, in the prehistoric bird section, there is a display of a suspicious looking yellow bird. Ehrgeiz (PSX - released 1/17/02 JP, 4/30/99 NA, 2/9/00 EU): See sub-page. 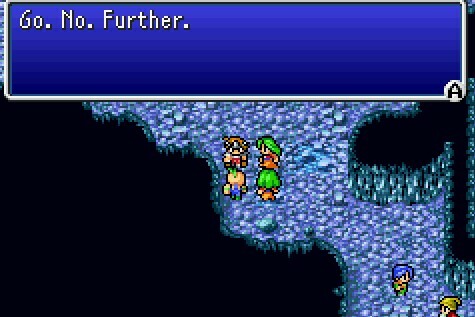 A bard named Gilbert (the JP name of FF4 Edward) is a minor character. One of the central enemies in the game, No. 9, wields a gunblade. One of Aya's secret weapons (a 12 gauge rifle) is also called a gunblade. Vagrant Story (PSX - released 2/10/00 JP, 5/15/00 NA, 6/21/00 EU): This game was made by the same team who did FF Tactics, so of course they'd stick some references to FFT in it. For starters, a lengthy quote in the stunning introduction sequence is attributed to "A.J. Durai" - better known as Alazlam from FFT. 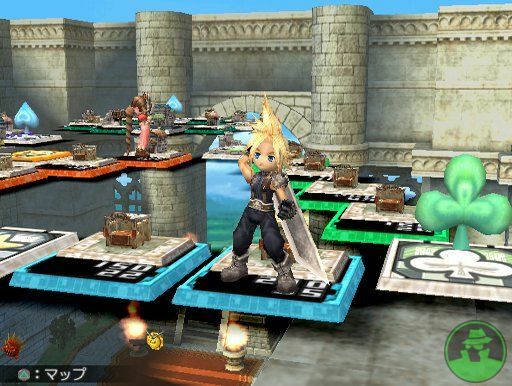 Four of the items in the game are "Agrias's Balm", "Beowulf", "Orlandu", and "Altema". Kingdom Hearts (PS2 - released 3/28/02 JP, 9/16/02 NA, 11/15/02 EU): See sub-page. "A sudden torrential rain shower accompanied by powerful winds, mainly occurring in tropical regions. Speaking of squalls... Oh, never mind." Kingdom Hearts: Chain of Memories (GBA - released 11/11/04 JP, 12/07/04 NA, 05/06/05 EU): This is something of a sidestory to Kingdom Hearts, although it incorporates a lot of elements that are seen in Kingdom Hearts II. The storyline of the game is based on Sora's memories of Kingdom Hearts 1, so nearly all the same crossovers that showed up in the first game (including characters, magic, keyblades, etc.) show up here as well. 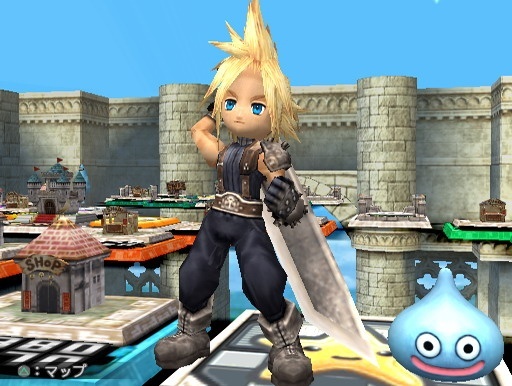 You can summon Cloud in battle where he can do Cross-Slash or Omnislash. The enemy cards also have FF abilities: Maleficent - Overdrive, Hades - Berserk, Wight Knight - Float, Oogie Booge - Regen, Vexen - AutoLife. Dragon Quest & Final Fantasy in Itadaki Street Special (PS2 - released 12/22/04 JP): Itadaki Street is a series of games similar to Mario Party that first appeared on the NES. 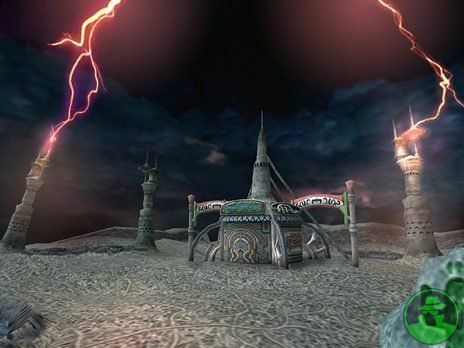 The series has always been popular in Japan, but this is the first time Final Fantasy elements have been in it, let alone an integral part of gameplay. 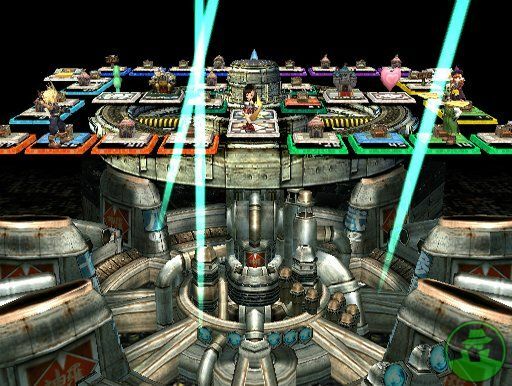 It includes the characters of Tidus, Yuna, Auron (FF10), Yuna, Paine, Rikku (FFX-2), Cloud, Aeris, Tifa, Sephiroth (FF7), Squall, Rinoa (FF8), Mog, TaruTaru (FF11), Vaan, Ashe (FF12), and the chocobo. 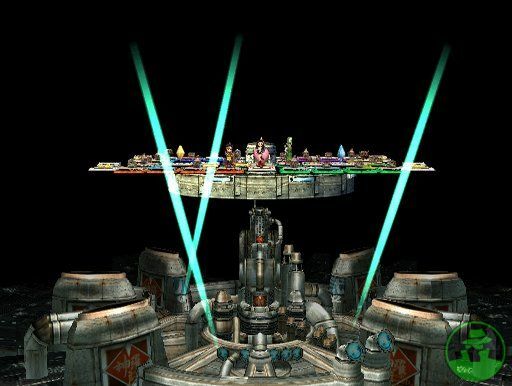 The featured stages are Midgar (FF7), three airships, Alexandria (FF9), Kilika (FF10/X-2), Thunder Plains (FF10/X-2), and two unnamed places from FF12. Shiva, Ifrit, Mandragora, Ramuh, Eiko, and Bahamut also make appearances. Official Website. Kingdom Hearts II (PS2 - released 12/2/05 JP, 3/28/05 NA, 05/26/06 EU): See sub-page. Mario Hoops: 3 on 3 (DS - released 7/27/06 JP, 9/11/06 NA, 10/26/06 AU, 11/10/06 EU): In this game licenses by Nintendo, but developed by Square, some job classes from Final Fantasy make an appearance as playable characters here, such as the Ninja, White Mage, Black Mage, Moogle, and Cactuar. Some enemies also show up to torment your player - Bombs and Malboros. There is also a secret stage called Malboro Garden - a swamp with two Malboros that attack with Bad Breath. The World Ends With You (DS - released 07/27/07 JP, 04/21/08 NA): The following was sent by Torklid Balog. Some of the pins in the game are named after FF summons, these are pins 242-245 and are named Tin Pin Ifrit, Tin Pin Shiva, Tin Pin Golem and Tin Pin Bahamut respectively. At a certain point in the game, a villain named Sho Minamimoto uses a super attack named "Level i Flare" a reference to the "level # Flare" spells. The letter i represents an imaginary number, one that can be found by drawing the square root of a negative number. From Spencer Thompson: In the "Another Day" scenario, one of the main Reapers calls out into a crowd, referencing FF7: Advent Children. 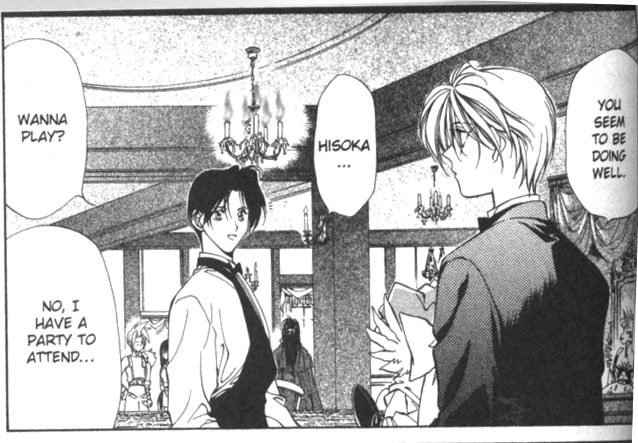 Higashizawa: Hurry and sign up! Dilly-Dally Shilly-Shally! Neku: Dilly-what? What the heck does that mean? These three games (Chocobo's Mysterious Dungeon 1 and 2, and Chocobo Racing) are almost part of the FF series, but not quite. Basically, everything is dumbed down and cutesied-up. Here's a list of what appears where (unfortunately, Chocobo's Mysterious Dungeon 1 was never translated into English, so my information is rather sketchy.) There are several more monsters which are direct from FF games, as well. Chocobo no Fushigi Dungeion (Chocobo's Mysterious Dungeon) (PSX - released 12/23/97 JP): Like any other RPG, the player takes on the role of an ever-changing Chocobo. With his moogle companion Atra, they travel to a Chocobo gardener's house. This gardener has uncovered a violet crystal in his garden and has become possessed by it. When he invites you in, he kicks you down into his cellar, and thusly, the dungeon, where your adventure begins. Chocobo's Dungeon 2 (PSX - released 12/23/98 JP, 11/30/99 NA): Some say it's like Secret of Mana with a turn-based battle system. Chocobo is once again paired up with Mog, where they travel to a small beautiful village. However, this village has many inpenetrable buildings, indecipherable ruins, and, of course, mysterious dungeons within. Other: Dalton of Zeal notes that the "Theme of Love" music track is identical to a similarly named track in FF4. 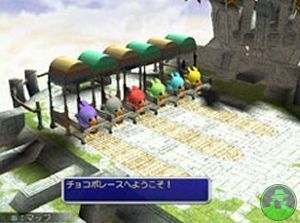 Chocobo Racing (PSX - released 3/18/99 JP, 7/31/99 NA): One day, Chocobo visits Cid at his laboratory, who provides him a new invention called the Jet-Blades CR, which increases Chocobo's speed greatly. This results in a great many races, culminating in a showdown with Bahamut. "On the FFVIII Circuit, you can see various monsters (the Malboro is the most prominent) and also a load of Glabadian Soldiers at one point. It also resembles the Bird's Eye View of Deling City a bit. What I mean by this is that whenever you seen Deling City from the President's microphone in FF8, there's a definite shape to the city. The FF8 circuit is almost the same shape. You can also see the front gate of the presidential residence, and there are screens showing the original Fighter/Warrior and Chocobo sprites from the NES series. Gysahl greens are advertised all around the track." Other: Moomba (species from FF8). Track 1: Cid's Test Track - The main chocobo tune. Obviously. Track 3: The Ancient Gate - If you listen really carefully you will actually notice that it's a really bizarre (albeit really cool!) remix of the Boss theme from FF3. Keep listening to it and trying to associate the aforemementioned tunes. Track 4: Mithril Mines - Mount Gulug. Track 5: Black Manor - The "Magician" Tune from FF2. Track 6: Floating Gardens (Mysidia) - The tune is "New Origins" which is the ending to FF5. Also, the name Mysidia is a mage village in FF4 and FF2. Track 9: Fantasia - The Final Boss tune from FF3j. Track 10: FFVIII Circuit - The Battle Theme from FF8. Obvious. Black Mage ("Magician March"): Remix of the Mysidian theme from FF4. Mog: A slightly altered version of Mog's theme in FF6. White Mage: City Theme from FF1. Goblin: A remix of "Pirates Ahoy!" from FF5. Behemoth: The Crystal Cave tune from FF3. The Chocobo Racing Remix is truly awesome. "Spooky-Wooky!" Fear tune - This is how the FF3 Final Boss theme opens up. (It plays twice then fires up the bit used for the Fantasia track). "La-La Legend" - Plays at any time relating to the Magicite Crystal legend. The Crystal Prelude with a little kid going "La la la" over it. "Chocobo Creatin'" - Remix of the FF3 Fat Chocobo tune. "Chocobo Choosin'" - Title screen, the Chocobo theme. The Legend of Zelda: A Link to the Past (GC - released 11/21/91 JP, 04/? ?/92 NA, 09/24/92 EU): The enemy known as a wizzrobe bears a resemblance to a Black Mage in this game. However, the same enemy in Zelda games before it and after bears little to no resemblance to this version or the Black Mage. Dragon Quest Heroes: Rocket Slime (NDS - released 12/01/05 JP, 9/19/06 NA): There's a platypus named "Ducktor Cid", as well as a big white slime named the "Crystal Chronicler". Neverwinter Nights 2 (PC - released 10/31/06 US, 11/03/06 EU): Micah Lemming says: "When I was looking through the Item codes of the game Neverwinter Nights 2: Storm of Zehir, I spotted in the dagger section a weapon called Tohn-Beh-Ri's dagger. 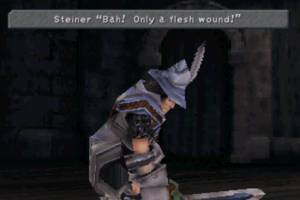 To reinforce this allusion, the item code for the dagger is nx2_tonberry." Phoenix Wright: Ace Attorney Trials and Tribulations (DS - released 8/23/07 JP, 10/23/07 NA): A judge makes a retort, replying with,"I'm no spoony bard!" Sent by Jako Swanson. "Robot Chicken", a stop-motion animated show on Adult Swim once had a sketch of characters from Final Fantasy 7 working at a fast food restaurant. The sketch in its entirety can be found on YouTube. Composer Chris Opperman created a piece called "Reviving Aeris". "Liberi Fatali" and "Fithos Lusec Wecos Vinosec" were played during the women's synchronized swimming event in the 2004 Summer Olympics. The 2000 movie Charlie's Angels shows two (?) children playing Final Fantasy 8 (you can distinguish Squall and party fighting a grat in the training center) at home before a naked Drew Barrymore comes to their window. That's what I call a good night. straybullet writes that a Korean band called "Drunken Tiger" released an album in 2000 named "The Great Rebirth". 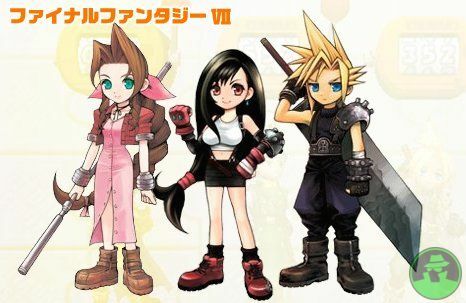 The second track in the album is called "Final Fantasy" and references the Cosmo Canyon theme from FF7. Also from straybullet: In 2006, a Korean singer named Ivy made a music video for a song called "Sonata of Temptation". The music video is essentially a direct parody/recreation of the fight between Tifa and Loz in Advent Children, and she was actually sued by Square Enix! The webcomic Order of the Stick features the cast of FF6 in a cameo comic. The first game to ever have had the honor of being ridiculed by a Final Fantasy game is the one and only Dragon Quest. 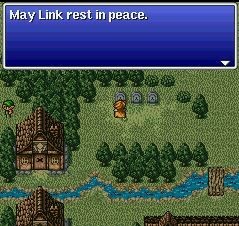 In the first FF, a gravestone reads "Here lies Erdrick". The main competition for Final Fantasy was Dragon Quest (Dragon Warrior in North America); in fact, it came out before FF and some say it was even the inspiration for FF. The warrior (not the one you play, one that died a long time ago) featured in this game was Erdrick (Loto in Japan). In the original Japanese, this gravestone read "May Link rest in peace" - referring to the Legend of Zelda series. 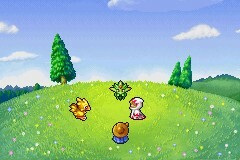 The line references Link in most versions of the game; the only ones which have Erdrick are the American NES version, the European PSX version, and the PSP version. 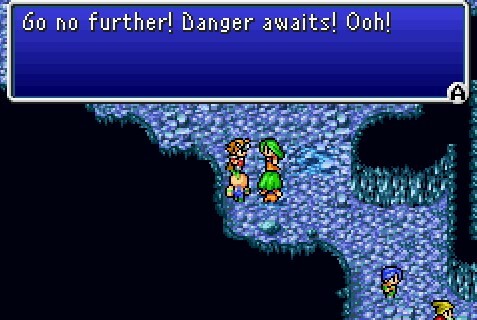 In FF5 Advance, a teleporter in the bonus dungeon references the famous "Welcome to Warp Zone!" line from the original Super Mario Bros. 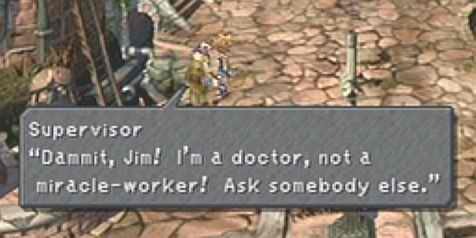 In FF9, the two people running Lindblum's Synthesis Shop are named Torres and Wayne, the two people who run the ammo station in Parasite Eve. 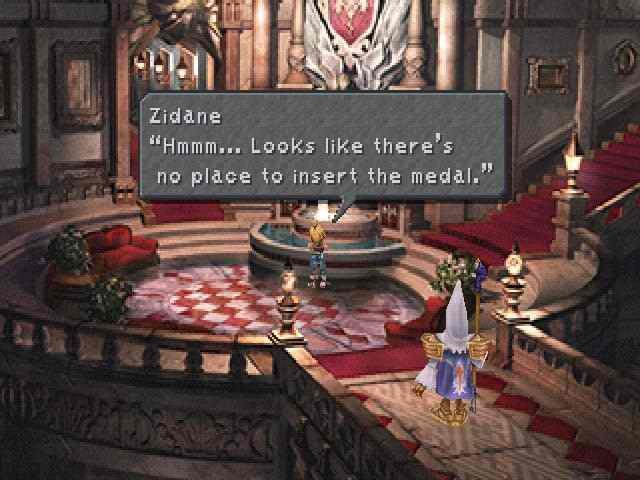 In FF7, after Cloud is rescued in Mideel, he mumbles "zeno...gias..." - a reference to Xenogears. The PC version apparently changed it to "xeno...gears". The first rant he has is a reference to Small Two of Pieces, the vocal song from Xenogears. One of its chorus lines reads "Broken mirror, a million shades of light". FF7: Two minor members of AVALANCHE, under Barret's tutelage. Killed in the plate drop. FF8: A captain and subordinate of the Galbadian Army, who continually get demoted with all their screw-ups. 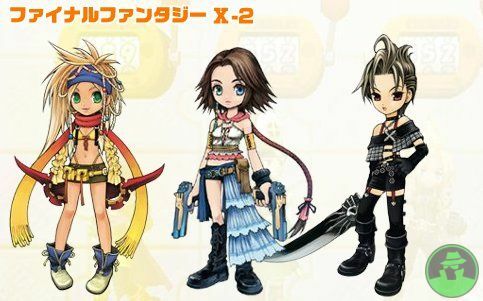 FF10/X-2: Two separate NPC's who double as recruitable Blitzball players. FF12: The guards at Nalbina Town are named Deweg and Gibbs. The name of Baron's airship force is called the Red Wings, Luke's squadron from Episode IV: A New Hope. The second airship that the party commandeers is named the Falcon, possibly after the Millennium Falcon. The scene where Locke rescues Celes from South Figaro. Red XIII itself is probably a dig at Luke Skywalker's Red squadron from the first Star Wars (Luke was Red Five). Tierce, Kyneugh, and Kanos, three of the Ravens, are named after minor characters in Star Wars. Piet is the name of one of the executors on the space station taking care of Adel's Tomb. Admiral Piett was one of the imperial officers of the Empire in Episode V and VI. 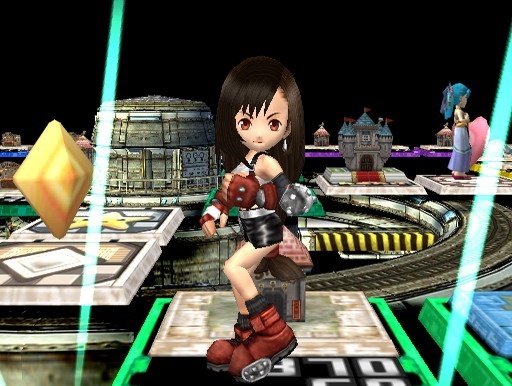 Nida is a minor character of FF8 who eventually becomes the pilot of mobile garden. Lorth Needa was a minor officer in The Empire Strikes Back, then became Captain. Martine, the headmaster of Galbadia Garden was called Dodonna in Japan. General Dodonna is the character who briefs the rebel alliance on the attack on the Death Star in Episode IV: A New Hope. Part of Necron's speech at the very end of the game is: "Fear leads to anger. Anger leads to hate. Hate leads to suffering." These words were originally spoken by Yoda in Episode I: The Phantom Menace. There is a more-than-coincidental resemblance of Orlandeau to Obi-Wan Kenobi. One of the largest references (although not obviously so) is the fact that Chocobos are largely believed to have been inspired by the riding birds from the anime Nausicaa of the Valley of the Wind. In Hellfire Chasm, several men throughout the cave will quote from the movie Labyrinth. Screenshot 1, Screenshot 2, Screenshot 3. Another character in Hellfire Chasm makes a reference to Homestar Runner. The ship called Enterprise is named after the one in Star Trek. The Nautilus has the same name as Captain Nemo's submarine in 20,000 Leagues Under The Sea. There is also a ship here called Enterprise, named after Star Trek. The four fiends (Barbariccia, Cagnazzo, Rubicante, Scarmiglione) are named after characters who reside in the eighth circle of Hell in Dante's The Divine Comedy. Cid makes a strange line when talking to Cecil about his airship, which may reference SomethingAwful.com. On that site, users are referred to as goons (this term is also used to describe developers and programmers in the gaming industry). In the new "Lunar Ruins" dungeon in Rydia's trial, there is a village a couple of floors down, filled with minis, pigs, and toads. Some of the villagers say "I haven't seen you before. Are you local?" This is a reference to "The League of Gentlemen", a british dark comedy that takes place in a xenophobic northern town. The show's shopkeeper asks this of their patrons, and if they answer in the negative, they are never seen again. From Andrew Csank: The character Mr. Clio, who who tells you your stats, is an obvious parody of the psychic Ms. Cleo. One character makes a thinly veiled reference to The Simpsons. Locke is asked to choose from three passwords. One, "Rosebud", is a reference to the movie Citizen Kane. The Three Stooges, Larry, Curley (sic), and Moe, appear as bosses in the American version of FF6, in Cyan's Dream. They look like children with wings. The song Johnny C. Bad is a reference to a popular song by Chuck Berry called "Johnny B. Goode", written in 1955. 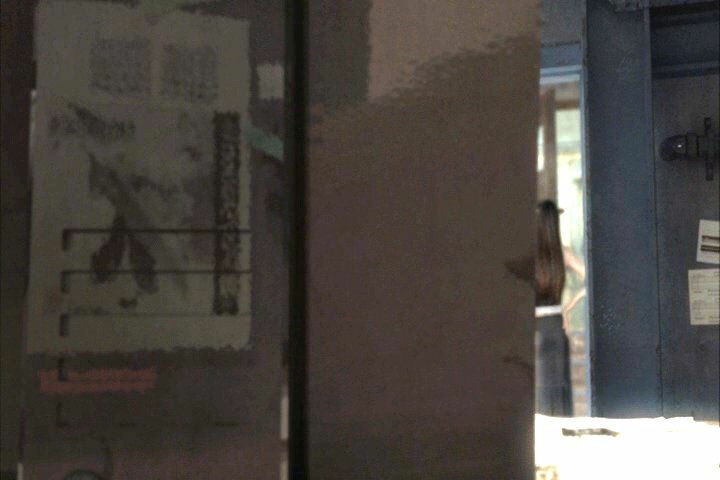 The plaque on Jenova's forehead in the FMV where Sephiroth takes off its head reads "Made in Hong Kong; All Rights Reserved 1996; Squer Company Limited". Barret's speech pattern and look was lifted from Mr. T, an 80's pop culture icon. The "Type D" equipment in Dio's Showroom looks a lot like Asuka's Magma Diver suit from an episode of Neon Genesis Evangelion. 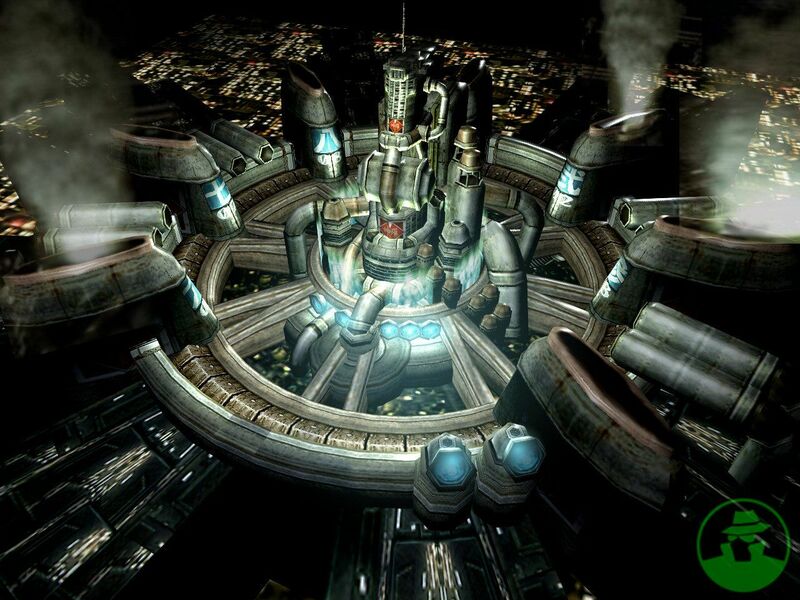 The memorial to Meteor and Midgar in Edge has the words "Keep on Rockin in Midgar" inscribed on it, a reference to Neil Young's "Keep on Rockin' in the Free World". The gate in Deling City bears a striking resemblance to the Arc de Triomphe, a famous landmark in France. The play "I Want To Be Your Canary" has several Shakespearean references - in particular, to King Lear. Two of the main leads in the play are King Lear and his daughter Cordelia; in FF9 this was turned into Leo and Cornelia. Also, the play's author is "Lord Avon". William Shakespeare was born in Stratford-Upon-Avon. The Black Mage, and Vivi especially, bears a strange resemblance to Orko, a magician from He-Man who often had his spells backfire for comic relief. Orko came before Final Fantasy so which begat which is indeterminable. The name Blitzball first occurred in A Separate Peace by John Knowles, though the games are unrelated. In the novel, Blitzball is a sport that is impossible to win, but focuses on athletic achievement rather than defeat and victory. 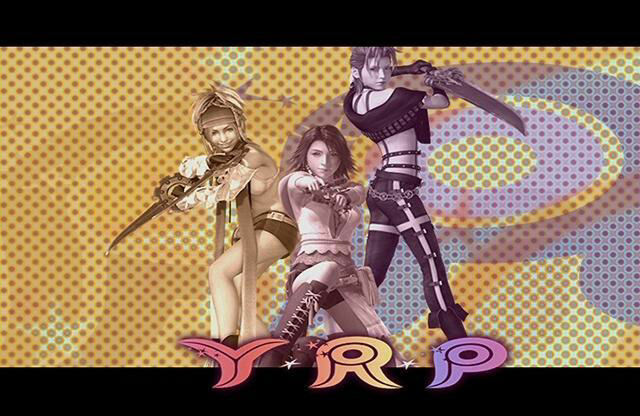 The three girls bear a stylistic resemblance to Charlie's Angels, especially in the first chapter of the game. This can be inferred from the flashy 70's style of their introduction. The first boss, Boris, which is a spider-type, is a reference to "Boris the Spider" by The Who. His "Sticky End" attack refers to one of the lyrics ("He's come to a sticky end/Don't think he will ever mend") and its entry in Shinra's Bestiary reads "maybe he's as scared as you" ("Maybe he's as scared as me/Where he's gone now, I can't see"). A Pose by Any Other Name - Pun of a quote from Shakespeare's Romeo and Juliet, "A rose by any other name." Catch It If You Can! - Reference to "Catch me if you can! ", a novel of Frank Abagnale and a Spielberg movie. Forge Your Destiny - Most probably a reference to the latin quote, famous during the Enlightment period, saying "Homo faber fortunae suae", that's to say "The man is the forger of his own destiny." Give Peace a Chance - Name of the famous John Lennon song. Inspector's Gadget! - Reference to the famous detective with the same code-name. It's Raining Mannequin! - Reference to the song originally recorded by The Weather Girls, "It�s Raining Men." Mirror, Mirror - An episode from Star Trek. Over the Hills and Far Away - Name of a Led Zeppelin song. The Die is Cast - Famous quote of Julius Caesar, "Alea iacta est," when crossing the Rubicon river and thus, starting the civil war. The phrase indicates a point of no return. The Opo-opo and I - Reference to the musical "The King and I." 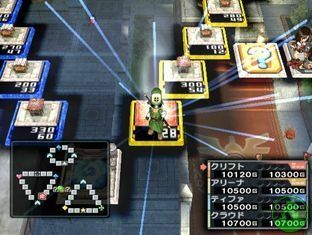 Note that the quest rewards the player with an item called "Opo-opo crown" and the title "King of the Opo-opos" to mark the reference to the "king" of the original title. The Postman Always K.O.s Twice - Reference to the crime novel "The postman always rings twice." The Prince and the Hopper - Reference to "The Prince and the Pauper" novel. The Siren's Tear (and relative item Siren's Tear) - Reference to a Sonnet of Shakespeare (Sonnet 119, What potions have I drunk of Siren tears). To Bee or Not to Bee? - Pun of the famous quote from Shakespeare. You Call That a Knife? - Reference to a quote of the movie Crocodile Dundee, "You call that a knife? THIS is a knife!" Bloody Rondo - an assault rather than a quest, but it mirrors the name of the Castlevania game Rondo of Blood. The main enemy to defeat in the assault is a monster called Count Dracula. "Lilliputians" (FF Tactics "Tozus Village" WotAW) is from the novel "Gulliver's Travels". The Hindenburg ("Salvage The Trade Ship!" Proposition) was a German zeppelin which caught fire and crashed in a horrific tragedy several decades ago.